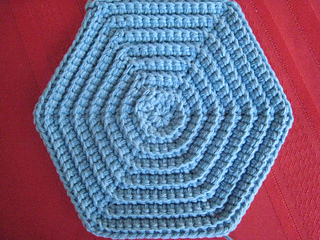 I’d been wanting to make a ridged hexagonal hotpad for some time. This month’s Nerd Wars on Ravelry gave me the push I needed. A hotpad that my grandmother had made has been sitting next to my computer for months to keep reminding me. Her hotpad was crocheted in size 10 crochet thread. This one is in worsted weight cotton -- and is a great way to use up left-over yarn or thread. It can be made to any size. The 8” size was chosen because that’s how much of that color yarn I had -- less than 1 oz or just under 50 yds. 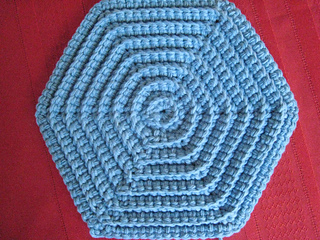 The hotpad is crocheted in a circle (not a spiral) and is done in sc and ch sts. The sc are worked through the back loop to give the ridged effect. Both the front and the back of the hotpad are pictured on this page.